New Year’s Eve in Germany is a time for food, friends and celebrations! Silvester is named after Pope Silvester, who was pope of the Catholic Church from 314 – 335. This celebration is held on December 31st in Germany, and it is an exciting occasion. Many people celebrate the occasion with sparkling wine, fortune telling with molten lead and at night there are fireworks. 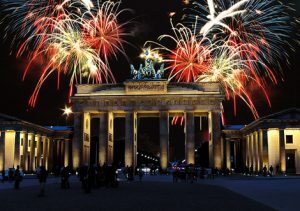 One of the largest celebrations of Silvester happens in Berlin every year! The Brandenburg Gate is lit up with bright lights, and people from all over come to the city! 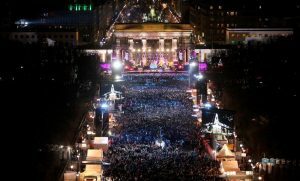 In fact, the city-wide party of Silvester has over a million people annually. There are multiple clubs in the city that host Silvester parties. However, many people simply dance in the streets as well! Street vendors will sell Sekt (sparkling wine) and Bratwurst, which are commonly enjoyed all through Germany for Silvester. Despite the coming of the New Year, celebrators of Silvester typically enjoy a variety of classic German foods. During the evening on Silvester, sweets are a very popular treat for young and old alike. Leftover Stollen and Cookies from Christmas are eaten, as well as new treats freshly baked! Most cities close their shops and businesses around 2 pm on Silvester, but many street vendors open shop for the holiday! 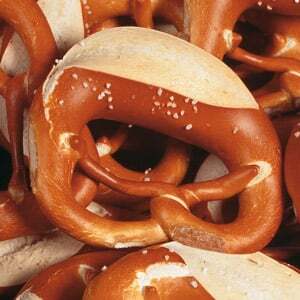 Commonly sold foods are Sauerkraut, Bratwurst and Pretzels! 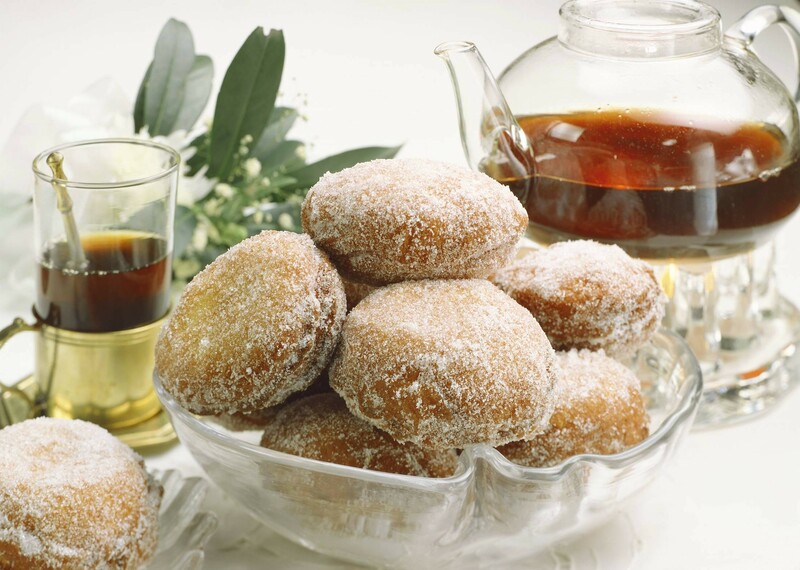 Perhaps one of the most well known foods for Silvester is Berliner Pfannkuchen (donuts). These jelly filled donuts are beloved by all, and very delicious also! They are typically filled with jelly or chocolate, although some are even filled with eggnog! Be careful though, Pfannkuchen also means “pancake” in parts of Germany! If you ask for Pfannkuchen during the year, you may be getting a pancake instead of a donut! However, if you ask for a Berliner, everyone will know that you want a sweet, celebratory treat! When midnight approaches, signaling the start of the New Year, people start a countdown. They count from 10 – 1, and when 1 hits, they make a toast to the New Year. This toast goes, “Prost Neujahr,” or Cheers to the New Year! Partygoers will clink glasses of Sekt, a sweet German sparking wine, and typically kiss at midnight. This is a very fun tradition, and one that the young people in particular enjoy! However, if you are at a more formal event you would not do this; you may not want to kiss your boss! What you would say, then, is “Frohes Neues Jahr,” which means happy New Year. It is a more formal way to wish someone joy in the New Year, but no less festive!